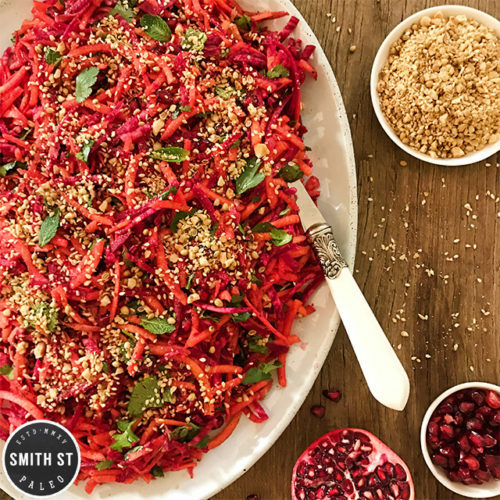 I could totally bang on about all the health benefits of this salad-the amino acids and fibre of beets, the hormone-balancing magic of carrot, the anti-inflammatory/anti-oxidant properties of pomegranate. But I won’t. Instead I’ll just say, this salad is delicious. Make it. The end. Peel and grate your veg. I used the grater attachment on my food processor, so much faster and less messy. It also leaves the veggies nice and juicy, not mushy. Toss them in a large bowl with all other ingredients except the dukkah. Mix up the dressing and pour over salad, then toss through. Sprinkle over the dukkah before serving. TIP- this salad lasts super well even once dressed, so it’s great for entertaining or lunch the next day. -my dukkah literally takes 10 minutes to make, but if you don’t even have that time you could throw in some other chopped nuts like almonds or pistachios. No pomegranate? Try raisins.